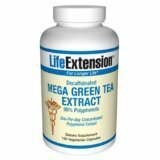 The botanical extract in Mega green Tea Extract has been concentrated and dual standardized to ensure the highest quality, consistency, and biological activity. Each serving contains a small amount of caffeine (max 3. 6mg). Since one cup of decaffeinated tea contains at least 9mg of caffeine, the amount of caffeine in this supplement will most likely not induce a stimulating effect.